Figurehead at the front of an old (19th century) Ao Naga log drum in the village of Ungma, the Ao tribe's largest settlement. Log drums are whole trees that have been cut down and then hollowed out. They served a variety of functions, including inter-village communication, warning a village in case of attack, and ceremonial purposes. 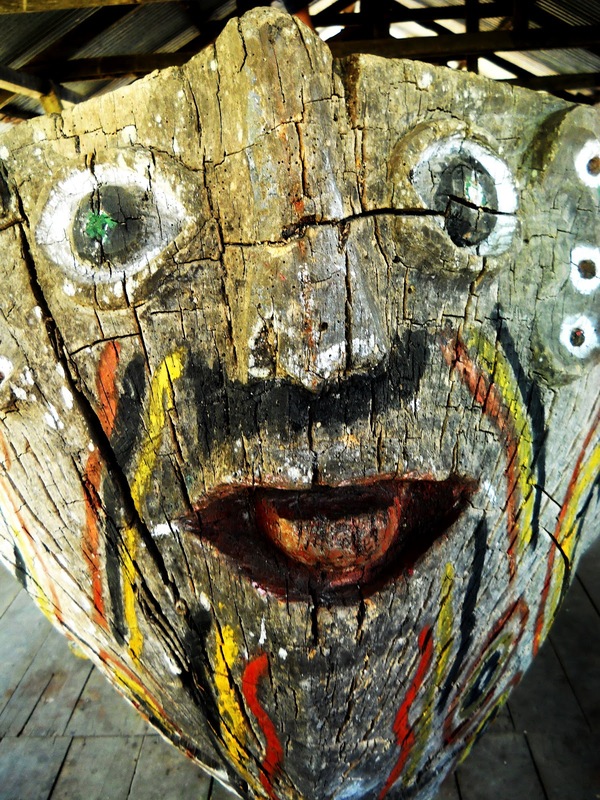 Apparently, back in the day, when a warrior would take heads he would first ceremonially drape them on the village's log drum, before hanging them on the villages special head-hanging tree. 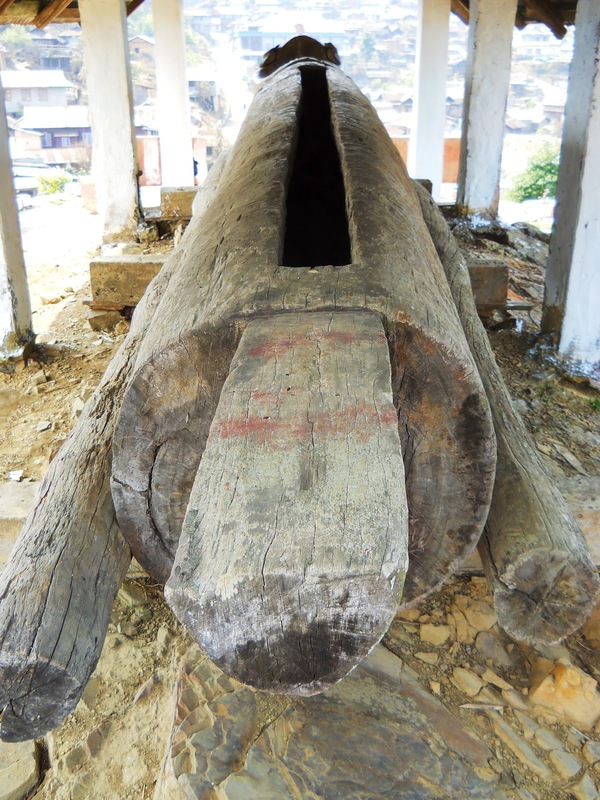 Log drums were mostly used by the more northerly Naga tribes, such as the Ao's and the Konyaks. Tribes such as the Anagami's and the Tangkuls didn't have them. However, various adjacent non-Naga cultures in Arunachal Pradesh, Burma, and South-central China did. The styles of log drums from tribe to tribe vary considerably. Hi. 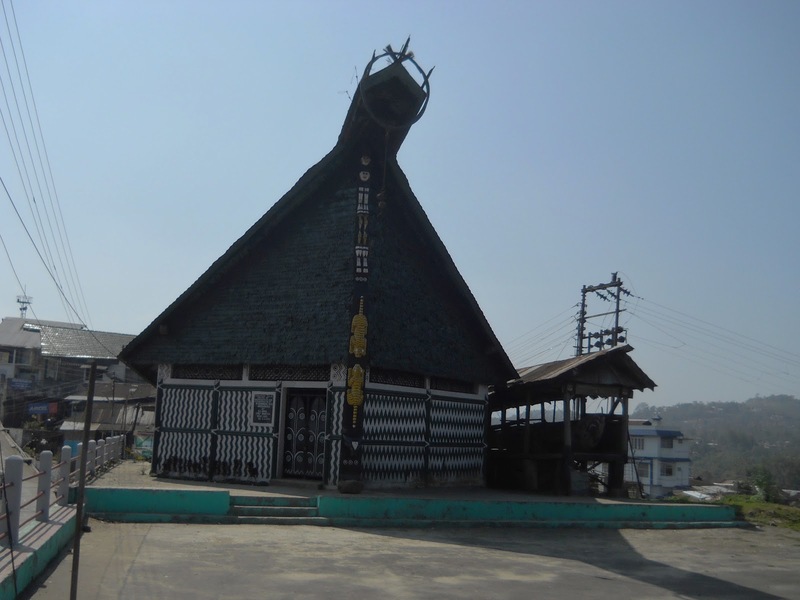 So, this is the second installment on my trip through Nagaland, covering the time I spent in Mokokchung district, the stronghold of the Ao Naga tribe. Of the three parts of the Nagaland that I visited, I would say that Mokokchung is the hardest sell: There's lots to see in Kohima, and Mon district is just nuts, but Mokokchung is mostly, well...just pleasant, and by pleasant, I mean that of all the places I visited in Nagaland, Mokokchung is where I would most want to live, and there's definitely something to be said for that. It's a very nice town, the people are friendly and the Ao naga women are perhaps the most beautiful girls I have ever seen...period. It's a good place to walk around, and it's near a bunch of interesting sights. My four days there were far from wasted. 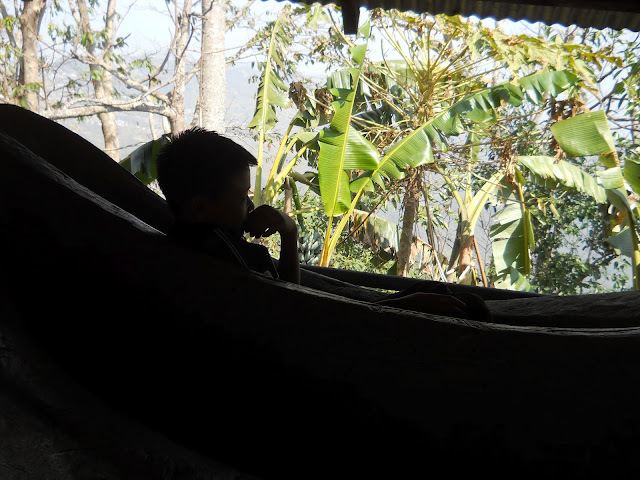 My trip from Kohima to Mokokchung, by way of Woka, took about seven hours in a Sumo, and that included about two hours stopping, once for lunch, once to fix a tire, and once to buy big fish. That trip was the first time I was introduced to the sort of music many Nagas like to listen to, which seems to be basically soft country and western, with plenty of songs about "Yesu" (Jesus). There was a woman who kept offering to share things with the other people in the vehicle. She would very loudly shove gum in everyone's face, in an offer that was clearly meant to be generous, though it got rather annoying after some time (though I, being the exotic item in the car, accepted far more gum from her than anybody else in the Sumo, who started ignoring her much sooner than I did). The drive itself was through the pleasant country of central Nagaland, over a road which was terrible in spots, but not that many. I had made a reservation at a hotel called Metsupen in Mokokcung. I had no idea really how to get there once I arrived in Mokochung, and had no other option but to trust to luck and hope I could navigate my way there upon arrival...and luck was with me, as one of the boisterous old Ao Naga women who had been riding up from Kohima showed me the way, and it was barely a ten minute walk. 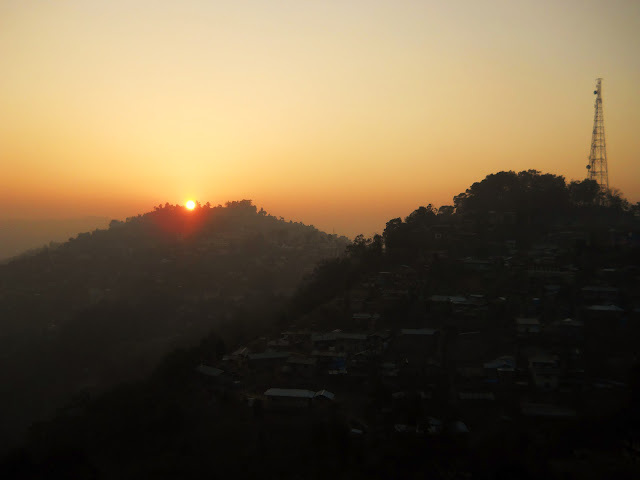 Mokokchung at sunset. As you can see, the town is sort of draped over a series fairly steep hills. The tops of the hills are developed, but the city sort of rises up like an island in a sea of jungle. If you simply follow any of the roads in the town downhill you wind up in quite remote jungle. 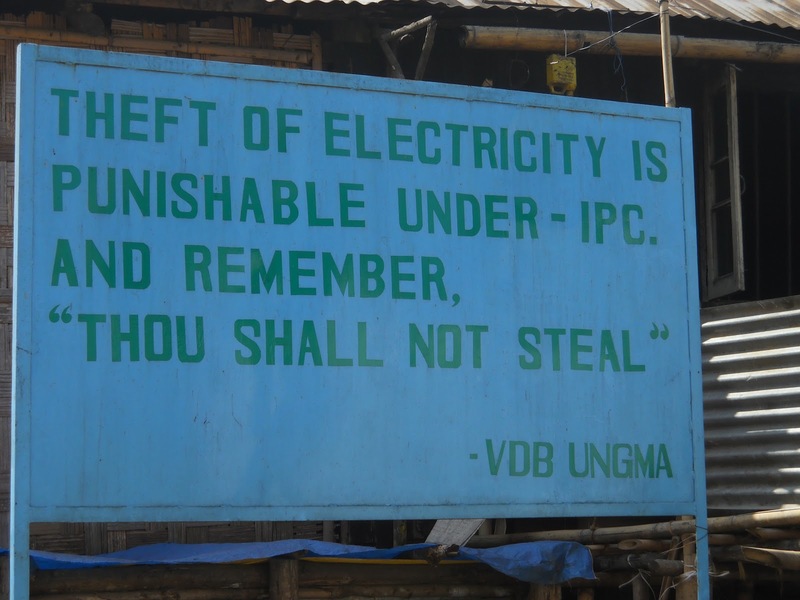 Another way in which Nagaland does not feel like the rest of India is that the population density, even these days, is clearly much lower than it is down on the plains. Anyway, as I mentioned above, Mokokchung is the cultural center of the Ao Naga tribe. 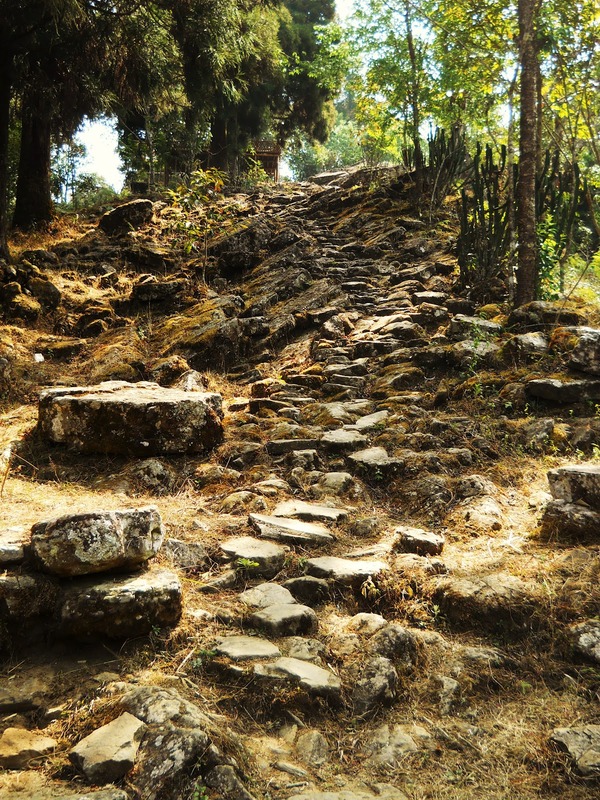 One of the things which distinguishes the Ao Nagas is that they were the first tribe to have converts to Christianity. For this reason, the Church has a longer history with the Aos than with any other group of Nagas. 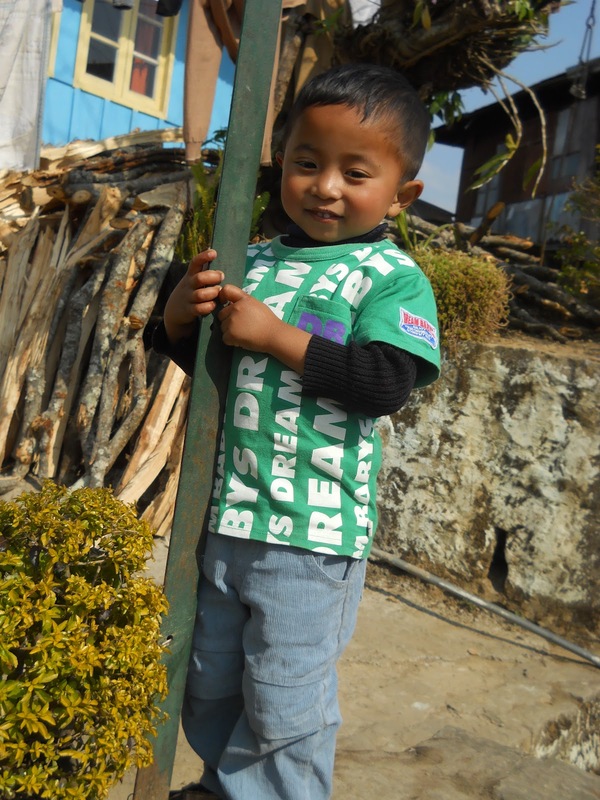 They are sometimes referred to as the Brahmins of the Nagas, as, because of the missionaries, the Aos were the first Nagas to receive English educations, and therefore became rather more prosperous than some of their neighbors. 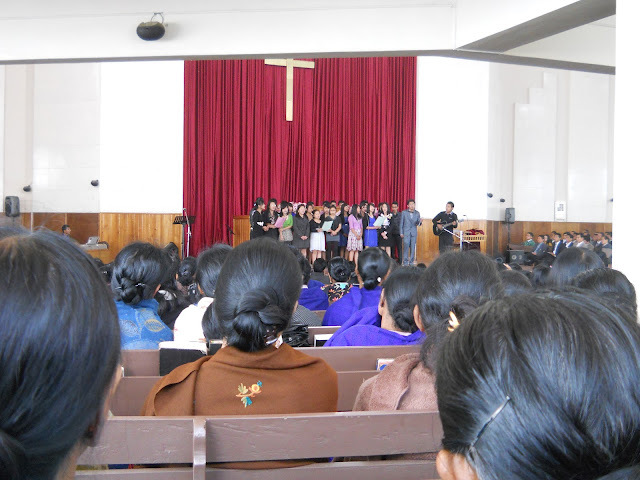 The first missionaries to actually make converts in Nagaland, the American Baptists E.W. Clark and wife Mary, operated among the Ao Nagas, starting in the early 1870s. And even though the number of actual converts the Clarks made was small (numbering only in the hundreds), many of the local headmen, sensing the benefits of a Western education, would send their children to be educated by them. This more or less ensured the ascendancy of Christianity, though the process wasn't instantaneous. It would take well over 60 years for Christianity to become the dominant religion. A sea of Naga Baptists, as far as the eye can see. The looks I got in here were much weirder than in the Catholic church. You don't get much of a sense of it in this picture, but this church was huge, and very well attended. There must have been around 6-7,000 people in there. I happened to be sitting next to a women who was half Ao Naga/half Khasi, from Shillong. In a well meaning sort of way, she was very adamant that I sing along with the hymns, despite the fact that I knew neither the tunes, or the Ao Naga language. In fact, I didn't know how even to form many of the sounds in the Ao Naga language, it being highly tonal, rather after the fashion of Cantonese (which it sometimes sounds like). But she was having none of that, and when I protested that there were a number of real and true barriers to my effectively singing gospel songs in Ao Naga, she informed me that: "Impossible is only in the Dictionary of fools" (which isn't really true, but I went along with it). Frankly, I got the feeling that the women viewed me as something of a white hippyish heathen who needed to be shown the way...but then again, seeing as many of the foreigners who do pass this way are white hippyish heathens, I don't exactly blame her. But she did decide to take it upon herself to translate (in a condensed form) the whole sermon that the preacher gave, which went: "Human beings categorize people ie. the high and the low. The lower caste are looked down upon. The mentality of our modern society has taken a positive attitude. The wall of class division is almost collapsing. Many individuals from the oppressed class has been able to rise to the highest leadership and they are the ones who is bringing sweeping change to the world...peace and unity is being accorded to each one of us by the death of Christ on the blessed cross and the wall that separates humanity is destroyed finally for by his death and resurrection we all become ONE IN CHRIST" (her italics). If that was indeed what the preacher said, than it smacks rather of Liberation Theology, but that doesn't surprise me too much. Most of the Naga Nationalist movements were, among other things, aimed at bringing about a Socialist State. 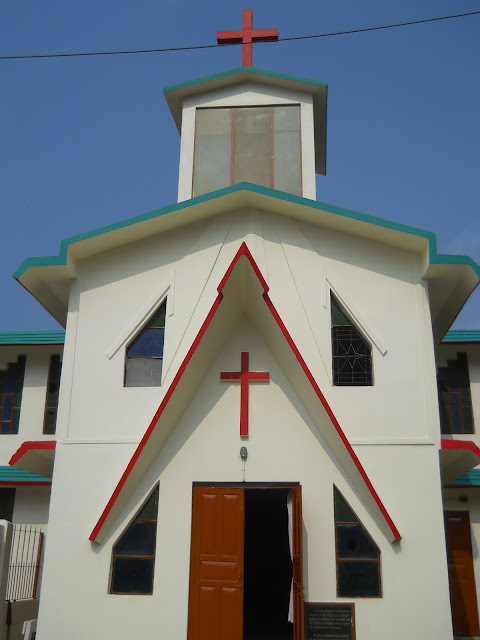 Even today, there is a Naga insurgent outfit in Mannipur that claims to be both Christian and Maoist, while still retaining the name "National Socialist." It's Northeast masala, no mistake. 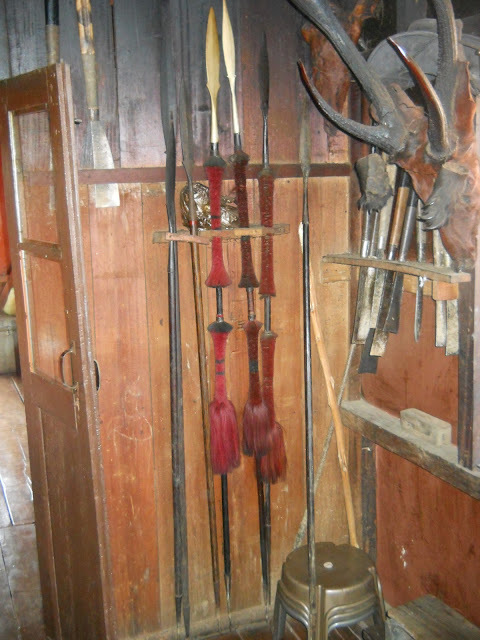 Spears, antlers, PVC foot stools. Typical Naga household items. 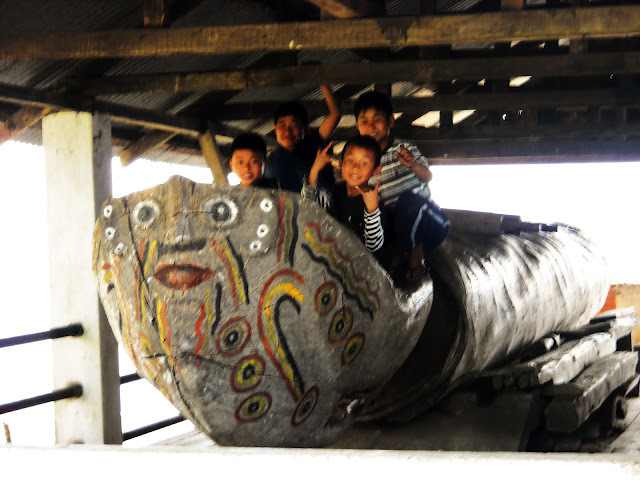 I was told that these fellows were the progenitors of the three main clans in the Ao Naga tribe. This thing is a guest house, though it gives you an idea of what an Ao Naga house used to look like. The Ungma village log drum is in that shed next to the guest house. Small blurry Ao Naga climbs into a drum. The moment I stepped out of the taxi I was followed by swarms of little curious kids. 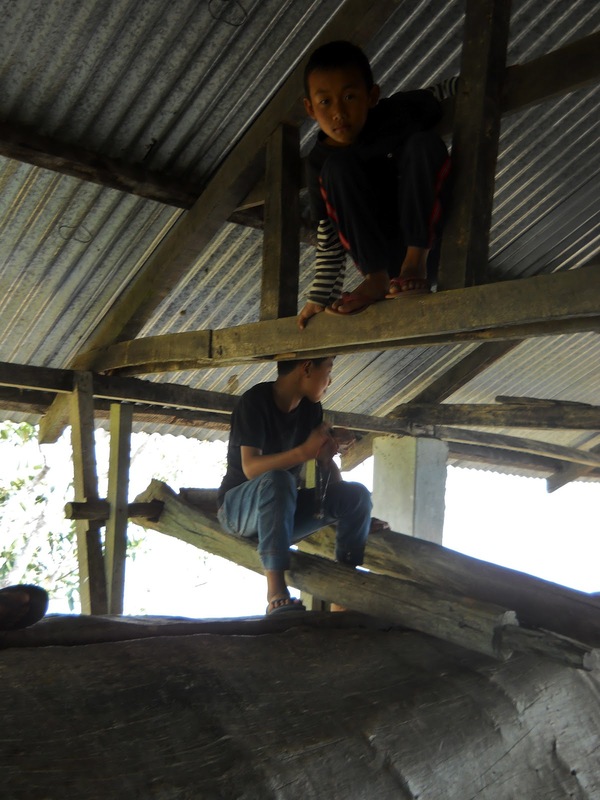 The hollowed out interior of the drum was wide enough that a kid could climb into it. Those two things that look kind of like rolling pins behind the kid are used to beat the drum. There are also a bunch of wooden pegs that are stored inside the hollow that you can take out and beat it with. During ceremonies or an attack by another village there would be a whole line of guys playing the drum. Small Ao Nagas (and, incidentally, one Konyak) give what appear to be American gang signs from the log drum. 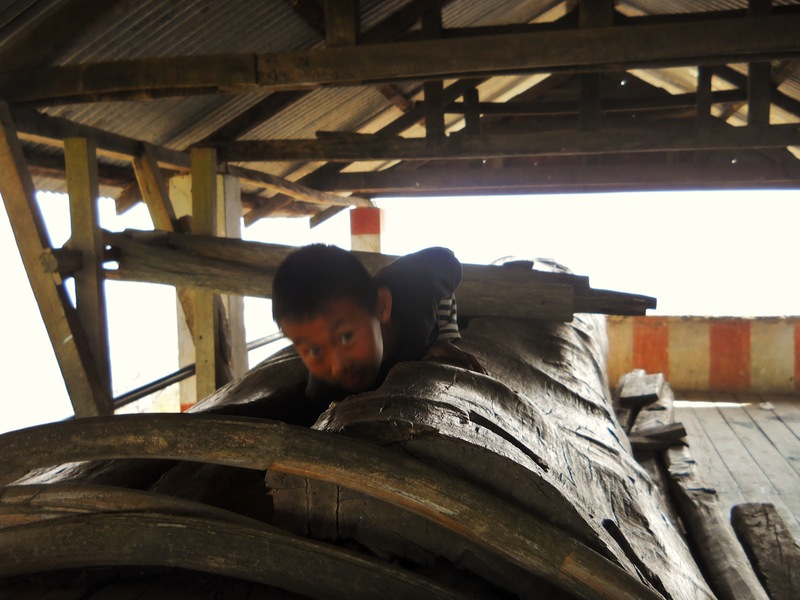 This is actually a different Ao Naga style log drum, in this case in Longkhum village, though the picture gives you a better idea both of the shape and scale of the instrument. 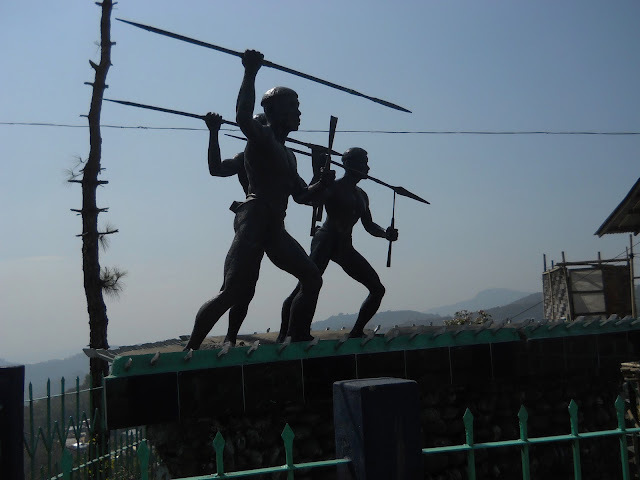 A monument commemorating the meeting of the missionary E.W. 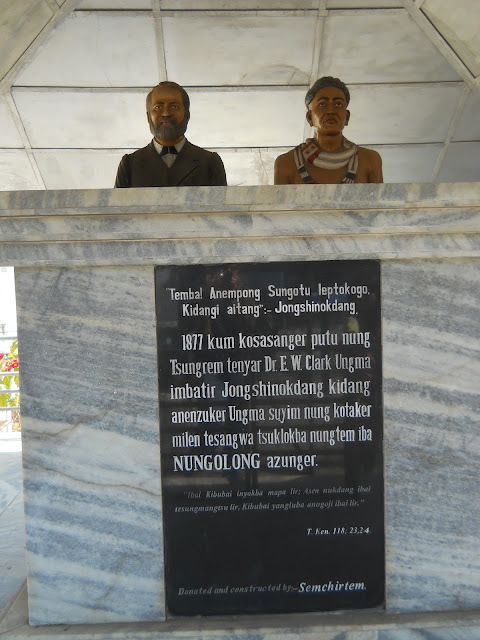 Clark and a village leader from Ungma named Jongshinokdang in 1877, which is considered the birth of Christianity in the village. Overview of Longkhum village, another Ao Naga village, this one situated in more dramatic surroundings. Again, like everywhere else in Nagaland, lots of churches. 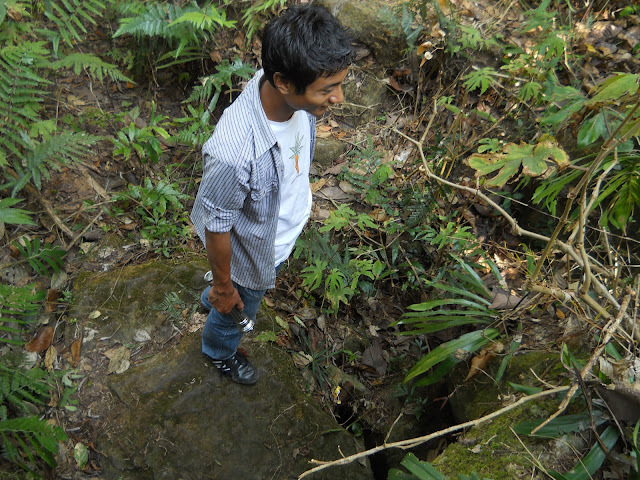 Supong, my (hired) guide for Longkhum village. I found out about him through the staff at hotel Metsupen. There evidently are'nt too many guides working out of Mokokchung. This guy and one of his friends seem to more or less have a monopoly on Mokokchung tourism. Initially, I was a bit disappointed by Longkhum...I think that many of the tourists who come here are hoping to buy textiles, but I simply didn't have the money (or the space in my backpack). 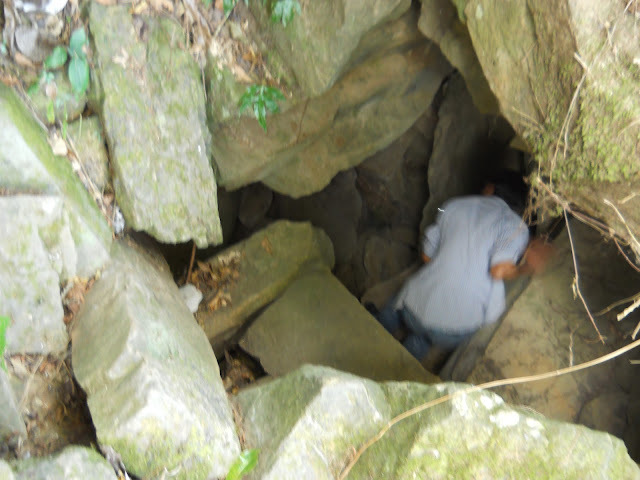 However, I had been told that there were caves in the village, so me and Supong, after asking the permission of the village headman, went into the jungle looking for them. The locals call this the Stone Bridge. It's just a ridge of stones through the Rhododendron woods that looks almost man made. 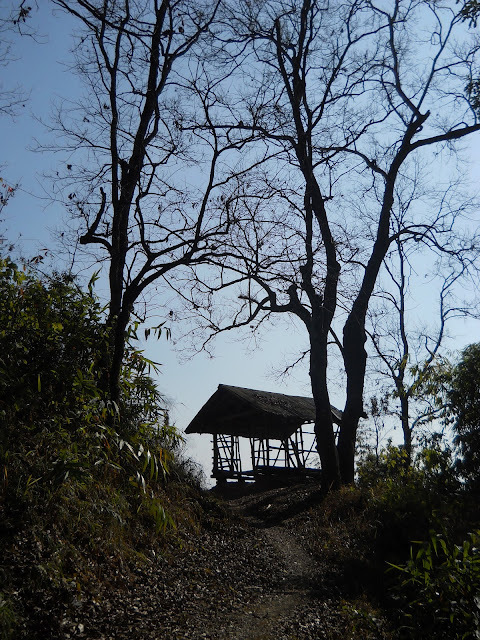 Historically, this was the invasion route that enemies would use to attack Longkhum village. Another view of the Stone Bridge. Supong pointed out to me that there were small holes in the rocks, that were apparently carved into the stones so that spears could be placed in them, the spearheads pointing straight up. These were meant as a warning sign to any would-be attackers: "If you pass this point, we'll kill you and take your head." Into the Earth with Supong. The caves turned out to be a series of open chambers in a huge pile of rocks. 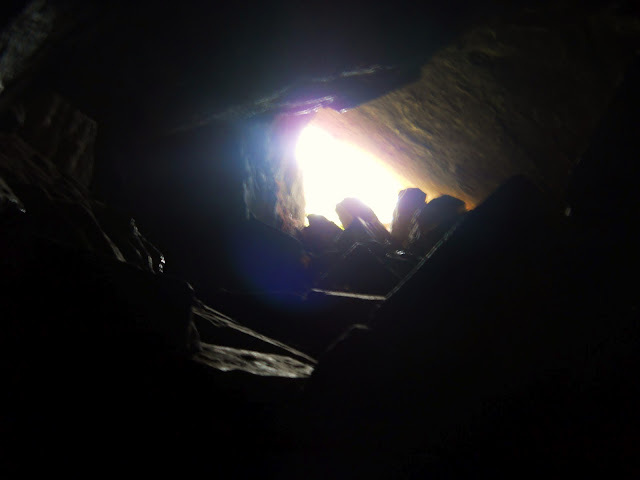 Usually each cave only consisted of a few chambers, each of which required fairly creative climbing and squeezing to get in and out of. 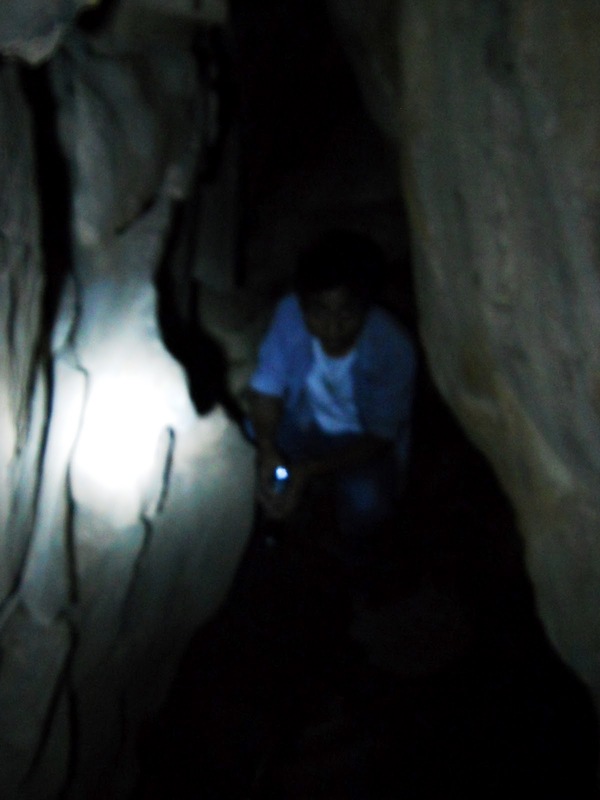 As I recall, the only light I had on me was my cell-phone flashlight: Not the best thing for exploring the underworld. Supong beneath the Earth. I would say that this chamber was about thirty feet underground. Though only a few chambers can be accessed by people, the actual system of interconnected passageways is said to be quite extensive. Dogs apparently disappear into this or that hole in the jungle all the time, and then reappear somewhere completely different. Also, when you're in these chambers, you can feel fairly significant drafts of cold air, suggesting that the caves are larger than what a person can explore. Mr. 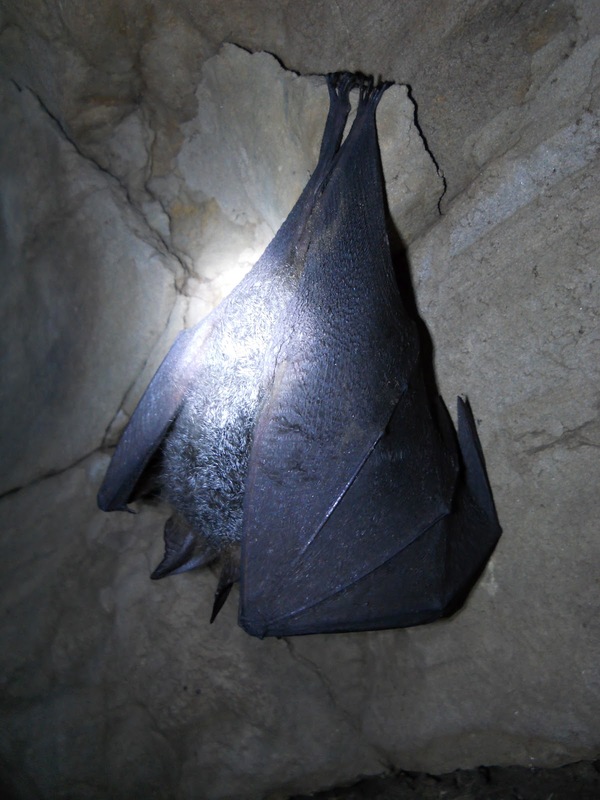 Bat. This guy didn't care about us at all. despite the fact that we were crawling all through his cave and making lots of noise, he never seemed to mind enough to stop hanging about. Supong, having just re-emerged from under the ground. 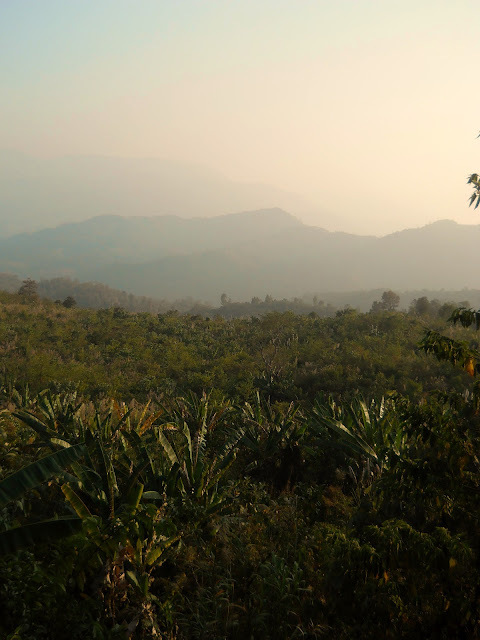 This spot is where the villagers of Longkhum claim that Etiben and Jenaba, the Ao Naga equivalent of Adam and Eve, had their kitchen. A little pavilion, in the jungle below Mokokchung. 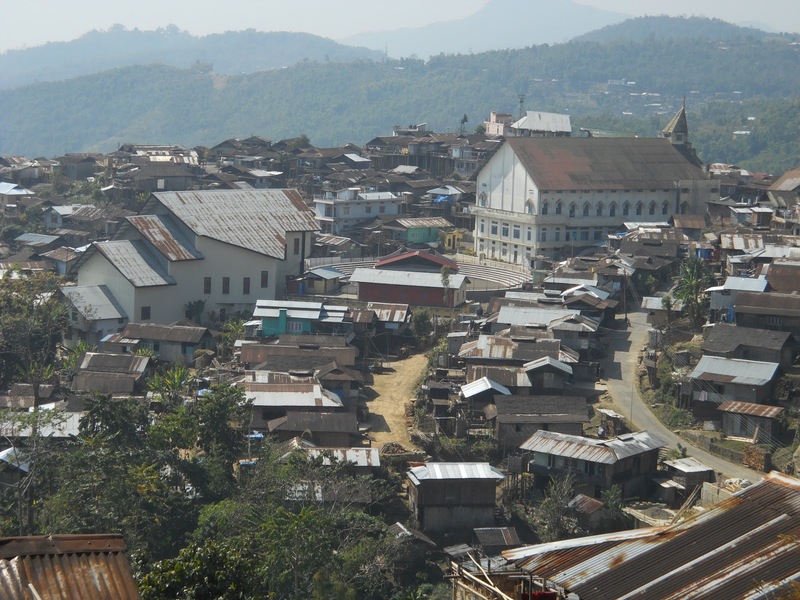 After visiting Ungma and Longkhum village, I had no real business left in the areas adjacent to Mokokchung, other than to go to mass on Ash Wednesday. However, there was still one thing in the town itself that I wanted to investigate: About a third of a mile away from Hotel Metsupen, there is a dirt road that leads down into the jungle wilderness in the valleys below the city. 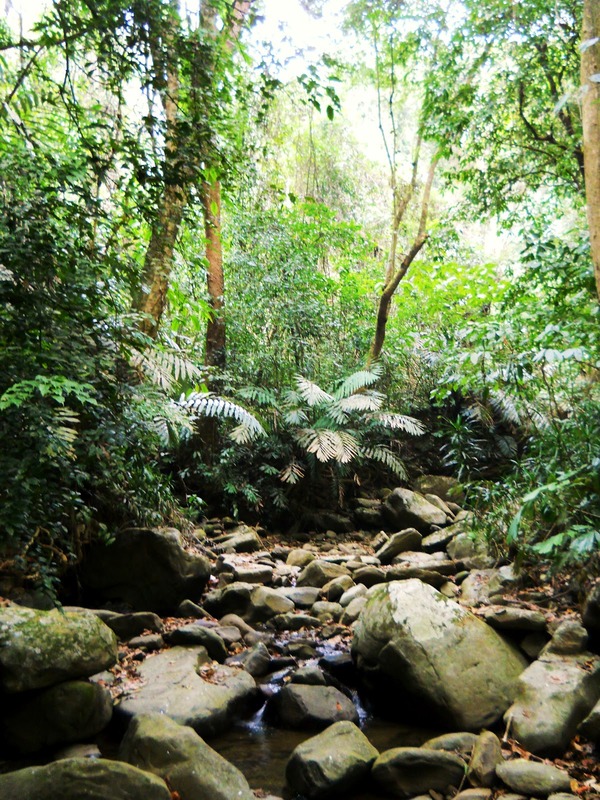 Despite not being a tourist destination at all, walking along this road and exploring the adjacent jungle was one of the most interesting things one could do in the area. 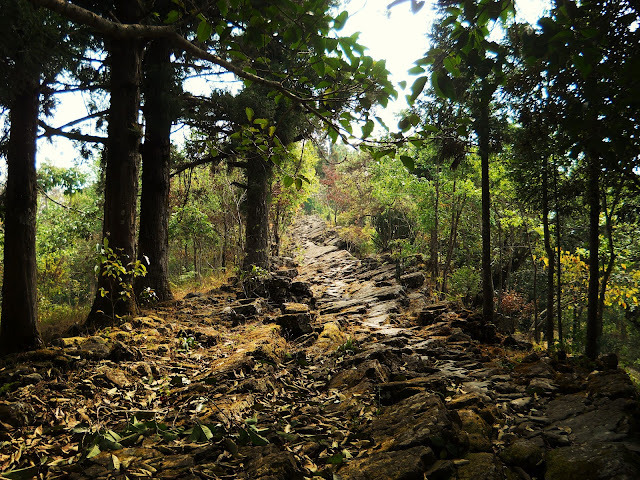 That being said, I think most people visiting Mokokchung wouldn't even think of simply turning down a random road into the jungle and following it for hours and hours. 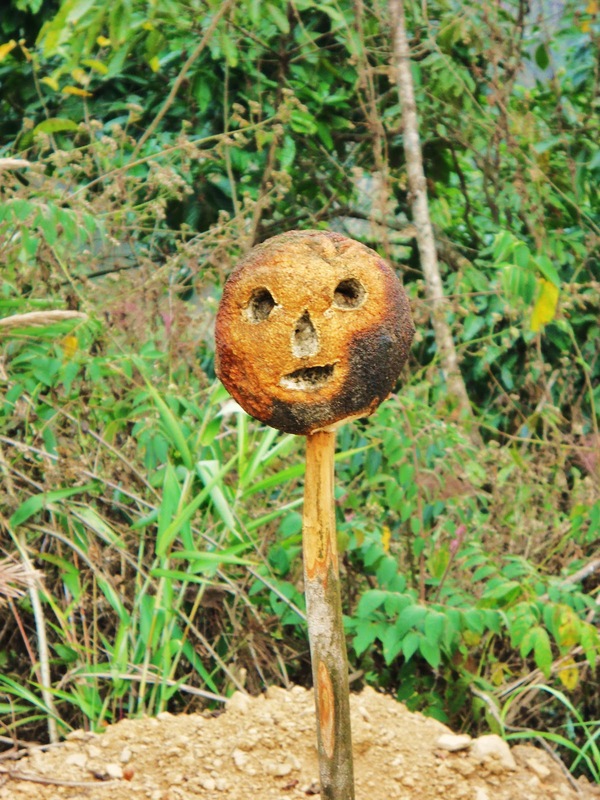 Grapefruit head on a stick. 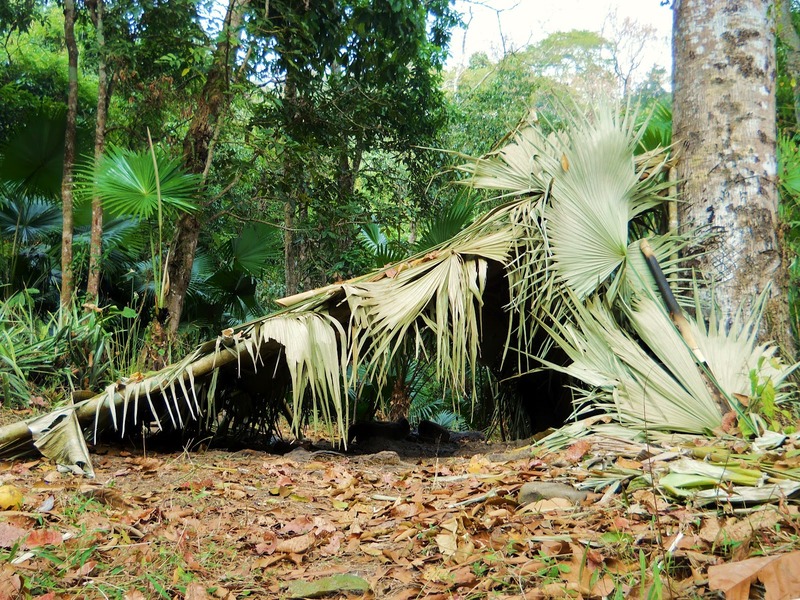 It's rather more sinister when you bump into it unexpectedly in the middle of the jungle, in territory that was up until recently ruled by headhunters. This was about 3000 feet below Mokokchung, miles from any town. 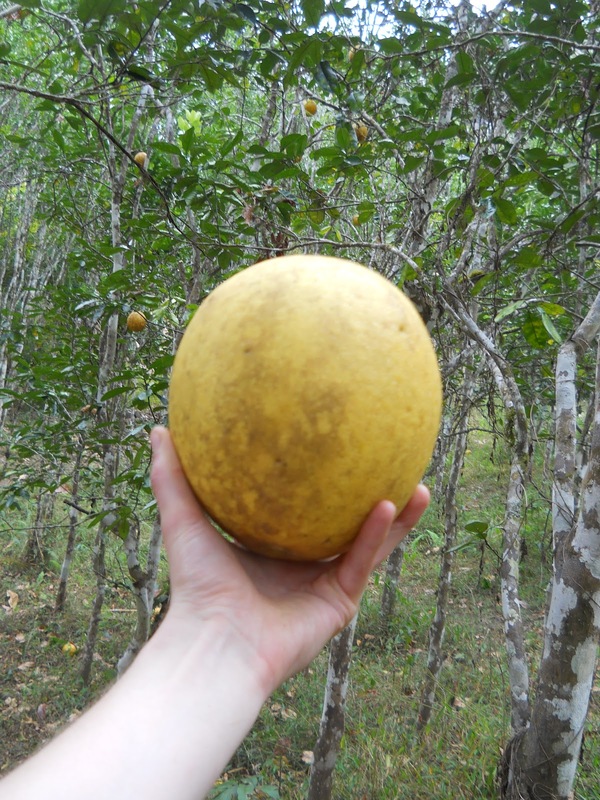 However, a little ways beyond this point there was a small, rather odd, little grapefruit plantation where they grew the biggest grapefruits I have ever seen. A jungle stream at the bottom of a valley. Grapefruit harvesters shelter. This was right next to the grapefruit trees. I'm assuming that this is where the grapefruit harvesters hang out. The stream from the last picture is at the bottom of a slope behind the shelter. 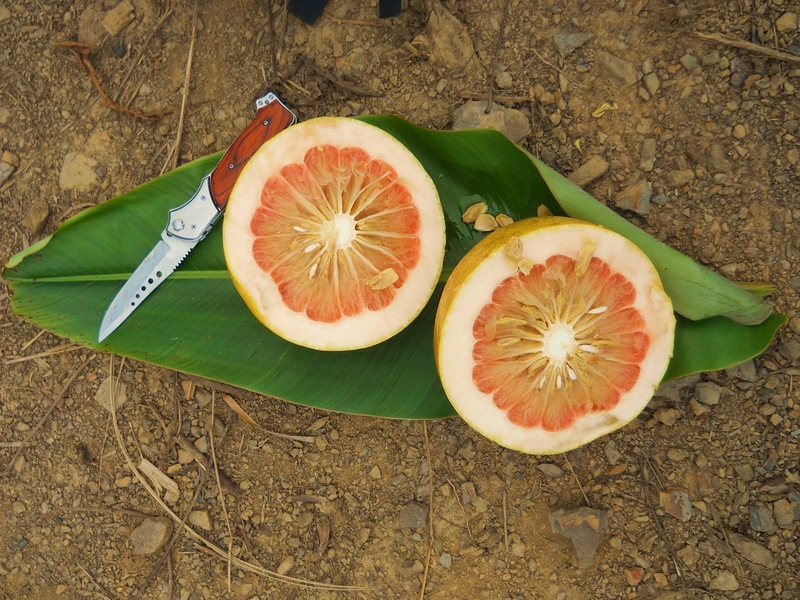 Grapefruit on a leaf platter, with switchblade for scale. I can honestly say that that was the best grapefruit I have ever tasted. However, slicing it open did destroy my knife. I think sugar from the fruit got into the mechanism and jammed up the springs somehow. Still...it was a damn fine grapefruit, and I regret not taking a few more with me. 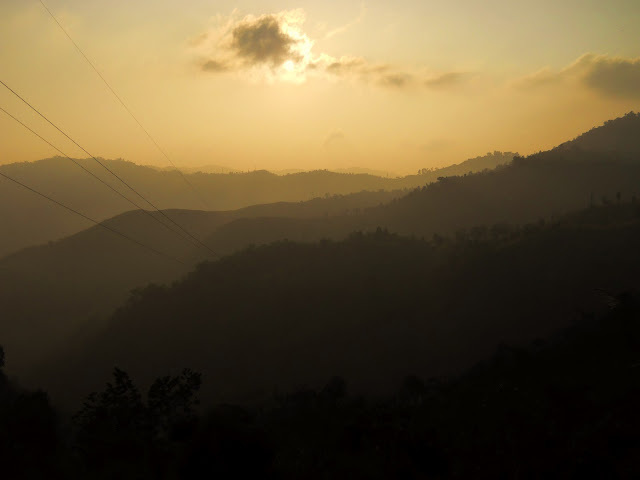 A view from the road, across the Nagaland jungle. As you can see, there's not too much in the way of development in this area. Power lines and sunset over misty Nagaland, from higher up on the road. 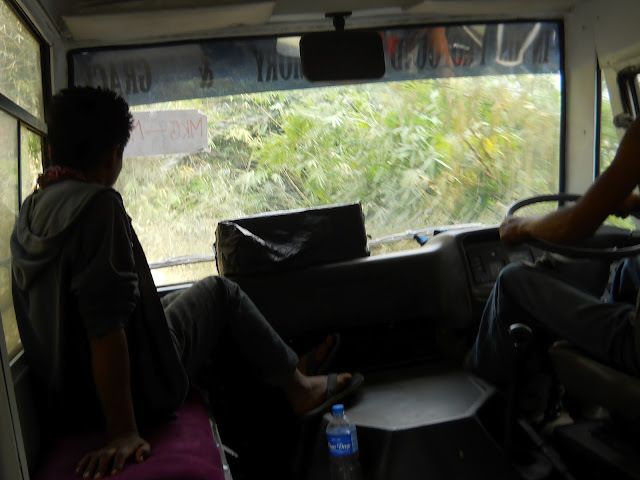 Riding out of Mokokchung, towards Mon. 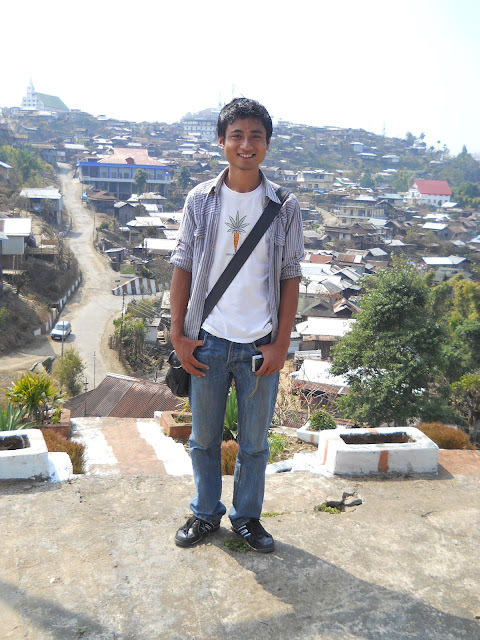 The few days I spent in Mokokchung district were very pleasant, and I would be happy to go back. 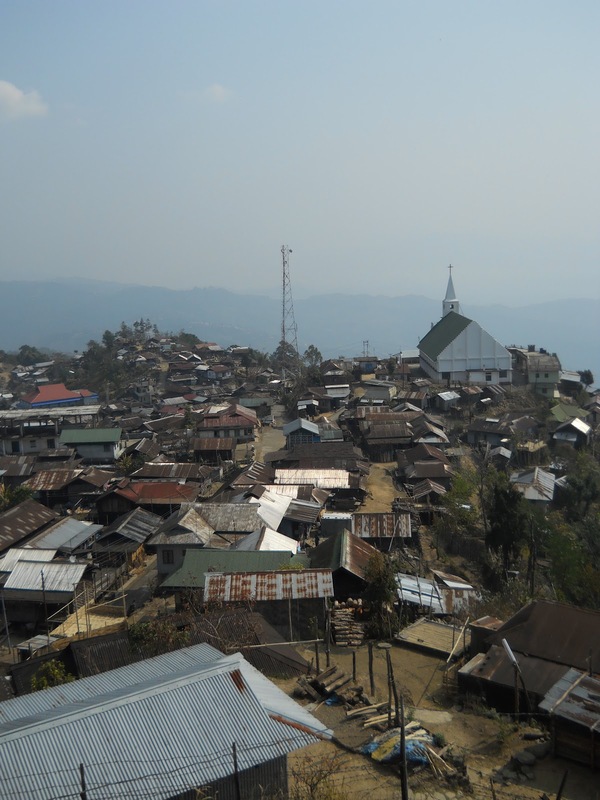 I believe in the Rough Guide to India travel guide they describe Mokokchung as "unexceptional." I think they say that because the sort of old Naga culture that one reads about is not really in your face in Mokokchung, at least when they're not having a festival. Nobody there still remembers the time of headhunting, and the locals started to convert to Christianity very early on. 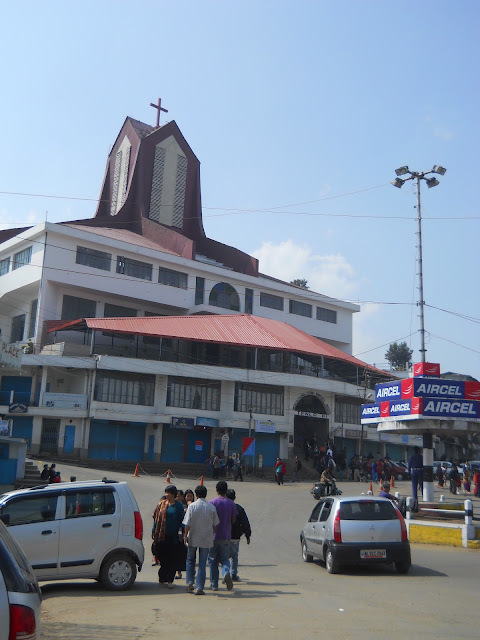 Of all the parts of Nagaland, the Mokokchung area seems like its been a part of the modern world the longest. My next destination, however, is a different story. As I rode in the bus pictured above, I was bound for a much brighter colored adventure than I ever would have anticipated.